Anyway, I have only heard about SUQQU from Lisa Eldridge's channel, and she has mentioned two products from SUQQU which are a must-haves from her kit - first, is of course the infamous SUQQU cheek brush and secondly, is their Eyebrow Liquid Pen in 01 Moss Green. I was very intrigued by the brow pen as I have used all types of brow products (pencils, pomades, powders, gels) yet I have yet to try liquid. Coincidentally, my brother was visiting Japan with his friends there, so I asked him to purchase it for me there - saves me on postage :) hehe. I was so anxious that my brother will mix up my request but he came thruuuuu (although you should've heard him panicking at the makeup counter - like a lost lamb hahahaha). So, as you can see from the photo - the packaging is a little bit damaged due to it surviving the flight in the midst of my brother's luggage (why, oh why). Boys do not understand makeup! I would have kept this in my carry-on!! Anyway, it comes in an otherwise sleek black box with the label engraved on it (laser-cut no less, fancy!) as well as the product name - Eyebrow Liquid Pen R. On the back, it has written directions in both Japanese and English, I'll highlight the important ones - 1. Wipe the brush off with tissue after every use 2. Store the pen horizontally. It is quite an interesting direction as for us architects, we have to treat our German-made technical pens with the same amount of care. Hence, I would advice against lugging this around in your makeup bag unless you are completely sure that it will remain horizontal! The Suqqu brow pen retails for 3240YEN or £20 via Selfridges (they do international shipping!). That translates to about MYR120 which makes the Burberry Eyebrow Definer similar in terms of pricing. For MYR120, it's safe to say that I wouldn't mind repurchasing it. Although, I wouldn't ship it directly from Selfridges - maybe ask my family members/friends staying overseas to assist me. As the name suggests, 01 Moss Green is exactly what it is. Moss. Green. It is a taupe-green shade with a cool-undertone. 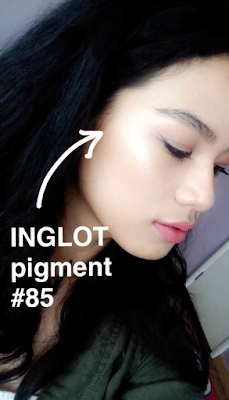 For the pigmentation itself, it is opaque enough to show up on my beige skin, but translucent enough for the brows to look natural and not look too drawn on. Honestly, it is very opaque for my liking as I don't like my brows to look stark/blocky. I really like how the greenish shade of the brow pen thickens my brows in a natural way and not look too blocky and squared. Somehow it just works with dark-haired girls. The olive shade just blends very well with my brows and since the brush tip is so fine and soft, I was able to create little tiny strokes to mimic brow hairs and finish off the tail of my brow which usually is a bit difficult if I'm using a pencil. I never have cleaned the brush with a tissue, but it still looks brand-spanking new and there is no issue in clogged up ink or anything. The handle of the brush is only 90mm long while the brush is 7mm long, so it is quite petite in size hence the reason why I always lose it in between car seats, so be careful! 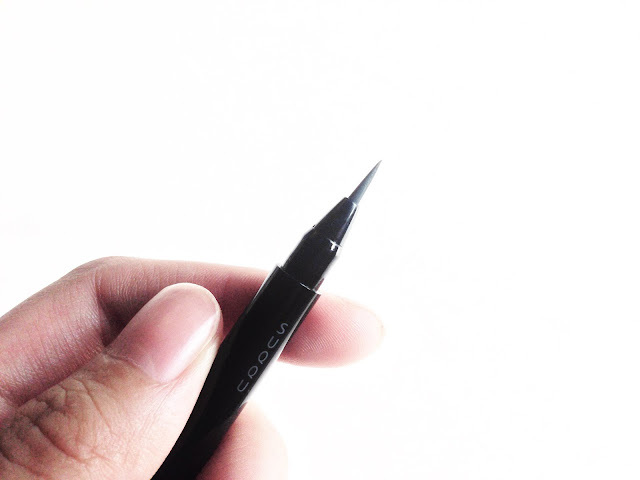 Despite the size, I can still get a good grip and draw on the brows with ease. The SUQQU Eyebrow Liquid Pen R has a very runny texture (duh). The product is obviously in a liquid form and completely doesn't budge after application. It doesn't change the texture of your brows like pomades and gels do, and it has a satin-matte finish. It doesn't look like a flat-matte as it is a more hydrating product. Upon application, you can feel that the brows feel a little bit wet, and I love to concentrate it in between the brows and draw onto the base itself rather than on top of the hairs - if that makes sense. So it creates an opaque tint on the base of the brows without changing the texture of the hairs. 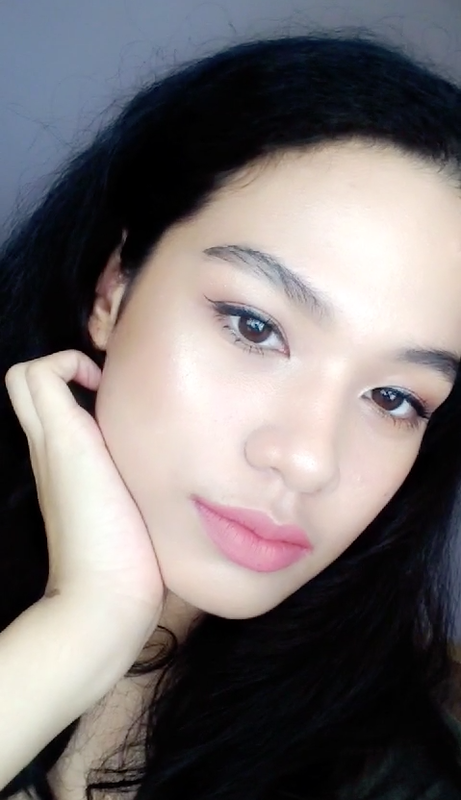 Of course, I do top it off with either the EYEKO Tinted Brow Gel or the Innisfree Brow Cara since the SUQQU brow pen does not give any hold to keep the brow hairs in place. The Eyebrow Liquid Pen R lasts through humidity and heat so you are definitely getting a bang for your buck with these as there is no need for touch ups! I have to be honest, it does take quite some time to get used to the texture and the way to use this brow pen, but after a few practice I got the hang of it. So, these are snippets of how my makeup looks like with the SUQQU Eyebrow Liquid Pen R in 01 Moss Green. I feel like it really enhances my brow shape and doesn't come off as too cakey which is what I like to go for. I do use this daily since I first purchase it, and as I mentioned before - there seems to be no problem in clogged inks and product build-up as the ink is very smooth and not thick enough to clog up. Overall, I do feel like it has become a necessity in my makeup routine, for even when I'm having a no-makeup day. The only con that this product has is that there are no SUQQU counters in KL! Boooo. Please bring in SUQQU! I really like that I can get a sharp tail with the fine brush tip and if you're looking for a similar product, Stila makes a similar brow pen - and I think a few Japanese/Korean brands you can find at Guardian/SASA/Watsons would have something similar. If you have a SUQQU counter near you, go and check these out! So, that is all for today's post and again, thank you for hanging out!